Lee Dong Wook was showing pleasant smile for the warming gifts from the fans. In early February 2012, the fans of the fan club of Lee Dong Wook who is playing the role of baseball player Park Moo Yeol in KBS 2TV drama series Wild Romance paid a visit to the filming set to cheer up the shooting scene. 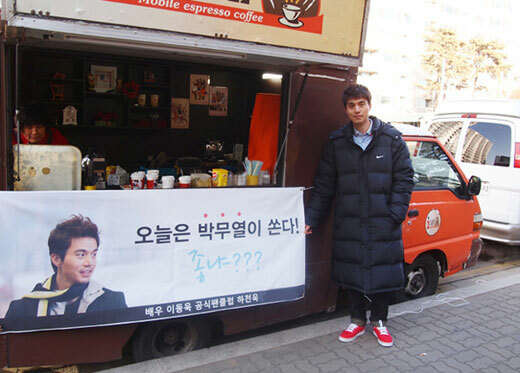 On the set of the day, the fans of Lee Dong Wook movie fan club prepared lunch boxes and sandwiches for actors and crews, giving warm food to actors and crews in the cold weather. In the cold weather, the gifts that contained the love of fans moved Lee Dong Wook. The love of fans warmed up the shooting scene, and Lee Dong Wook expressed his gratitude to the fans. On the other hand, Wild Romance where the love line of Moo Yul and Eun Jae is in full swing broadcast every Wednesday and Thursday night at 9.55pm.